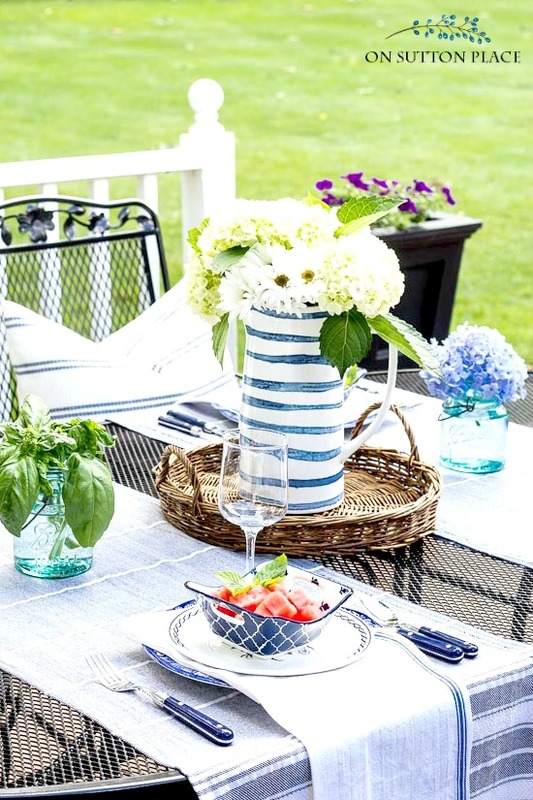 Summer Entertaining Tips & Ideas for Al Fresco Dining. 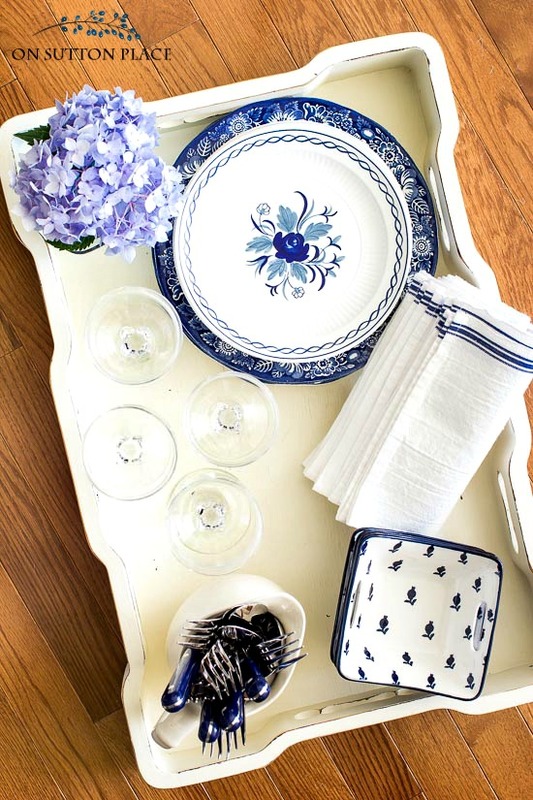 Blue & White tablescape ideas. Tablescape layering tips. 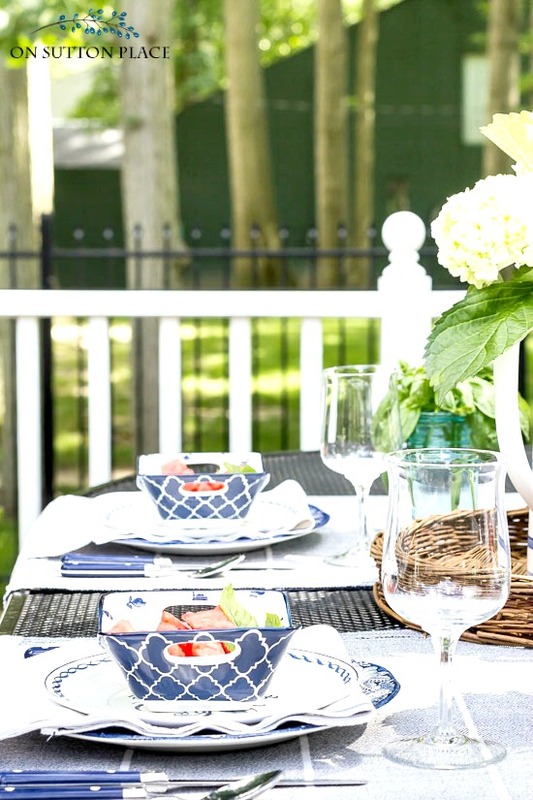 Ways to make outdoor dining fun & easy! Eating outside in the summer is one of my favorite things to do. It’s relaxing, the fresh air feels wonderful and the food tastes better. Al Fresco dining at home can seem like extra work but there are ways to simplify the process so it’s enjoyable. 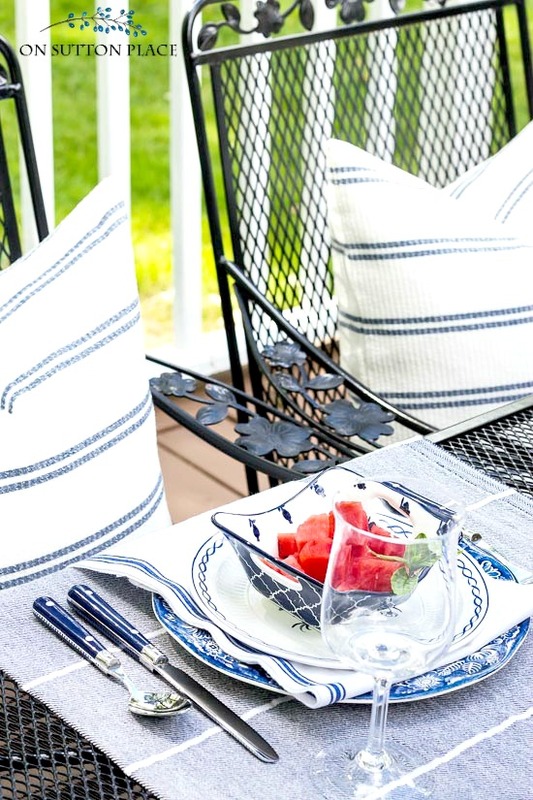 Today I’m sharing my summer entertaining tips along with other bloggers on our Summer Entertaining Tour hosted by Lory from Designthusiasm. If you are coming over from StoneGable, welcome! There will be more links and inspiration at the bottom of the post…so stick around! 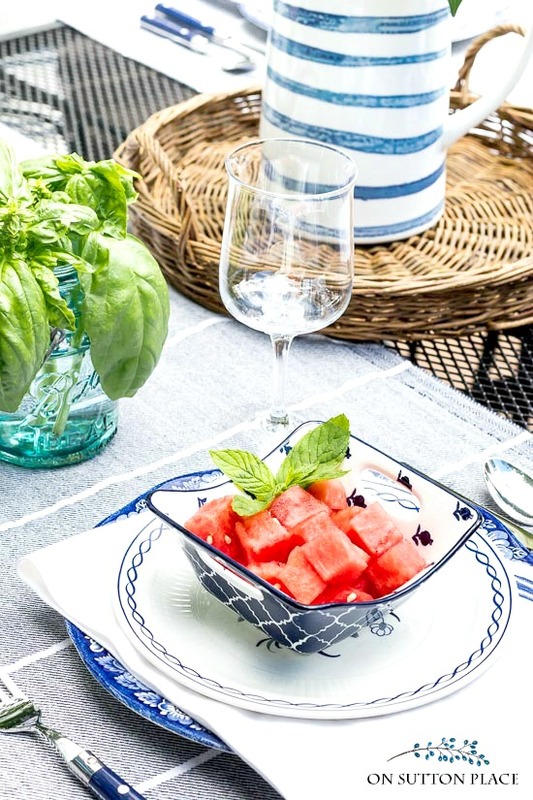 One thing that is crucial to outdoor dining success is a large but light-weight tray. It makes carrying items in and out super simple. I use the one pictured below. It usually lives on my dining room table or coffee table so it’s easy to just grab it and go. Source tip: I found this set of trays that would work perfectly and is a great price. Layering a table is the perfect way to show your guests that you made an effort…without really making an effort! It’s so easy but it looks like you spent a lot of time putting everything together. It takes no time at all to place a tray under your centerpiece…or stack some plates. Al Fresco dining can be easy and fun if you keep it simple. Use what you have and don’t be afraid to mix things up. Combine new and vintage linens. Add texture with fresh flowers and natural wicker. If your seats are missing cushions, add comfy pillows. As I was writing this post, some memories from the past surfaced and even though it’s hard, I’d like to share them with you. When my kids were growing up, my parents lived in a lovely brick house with a screened-in back porch. My mom’s porch furniture included a big round table and chairs. Almost every Sunday in the summer when my husband was golfing, I would take the kids out to my parents’ house for lunch. My dad would cook steak on the grill, my mom would make baked potatoes and a big salad, and I was in charge of setting the table on the porch. My mom had a tray that I would pile up with pretty plates, cloth napkins and tall glasses for lemonade. It usually took two trips to get everything out there but it was so worth the extra effort. Looking back now, those lunches were some of the happiest times spent with my parents. Dining Al Fresco at its very best. So grab your tray, fire up the grill and make some memories of your own! Thank you for stopping by! Now…please go over and visit the next stop on the tour, my friend Lidy from French Garden House…and then take a minute and check out the rest of the links for today. 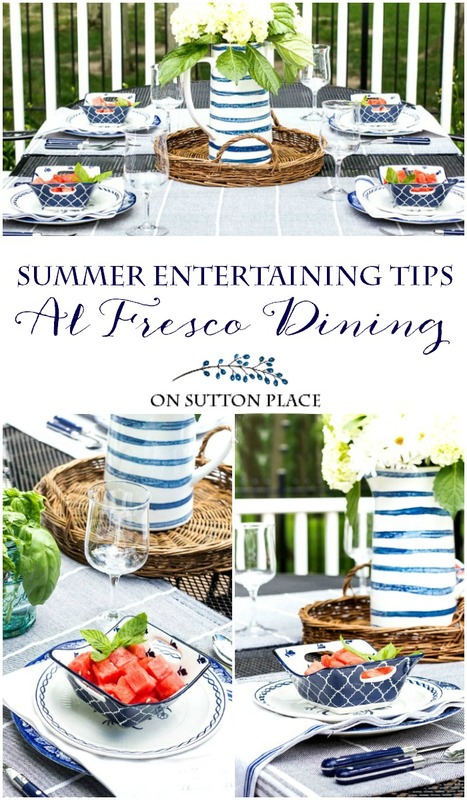 There are summer entertaining tips and ideas plus so much inspiration that I know there is something for everyone! Beautiful setting! Thank you…for the inspiration. Haha…yes. Purchased really long ago! Wonderful, just wonderful! Thank you, Ann! I really love the table and how you set it! So lovely..I love the fruit bowls and want to ask …did you purchase them from Hobby Lobby or does H.L have something similar? 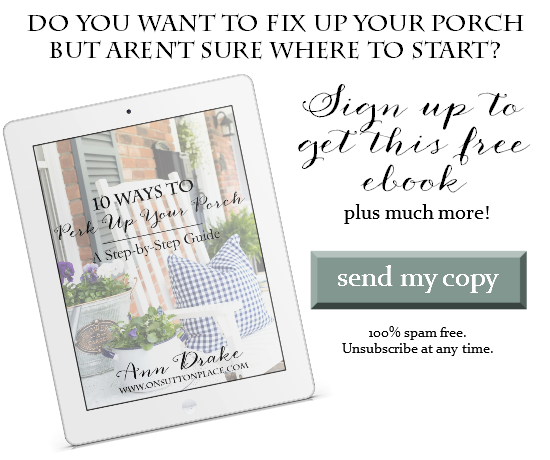 You are a new blog to me and I am going to sign up today!! Just lovely! I wish I were coming to have a dinner-or lunch-on your deck/porch! 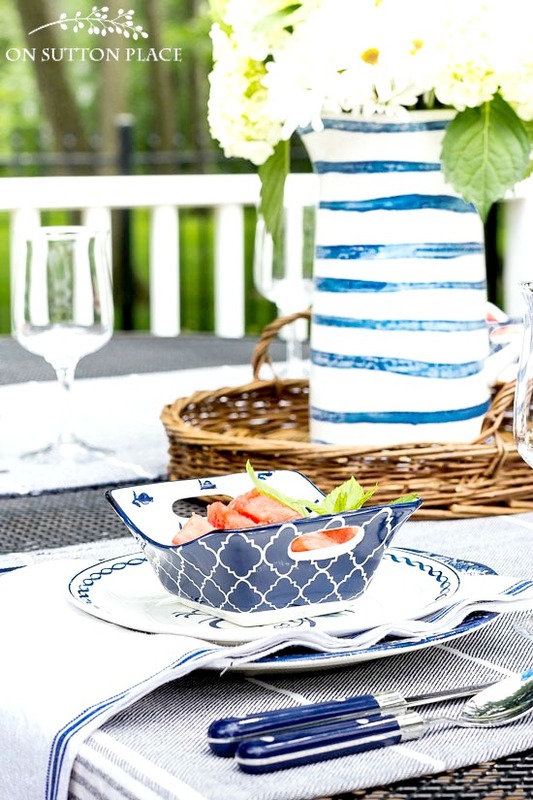 I love all that blue and white and there is that versatile striped pitcher again! Sweet memories of those meals with your Mom And Dad and the grandkids. I bet they just loved having you come. I must get a nice tray! Love, love blue and white. Clean, pleasing contrast, lovely details. Ann, I love all these stripes! You have a beautiful backyard and of course style ;) So great being on this tour with you. Anne, I feel like you are a special friend that lives next door. I wait for On Sutton Place and read it with joy. You inspire me to go through boxes of old decor and to use it in new ways. Yesterday, I handed my husband a small stick wreath decorated with sea shells. He decided to redecorate his bath room. I added a sailboat that I made for a summer event using white foam and some sail cloth. From there he added navy blue towels in a canvas tote, led candles with small shells and sand. lastly he added a throw that brought in some blue green color and changed things up a bit. I want to send pictures but I don’t think I can add them here? Thank you and your new friends for all the creative thoughts. I’m so in love with all this blue and white! I’m just crushing on that color combo so much right now. It is so fresh and crisp, and I love your dishes, the layered linens, and especially that cute pitcher! Such a wonderful table Ann! As always, I am impressed with your ideas. It lifts my spirits to see your email ready for me to enjoy. I need those fruit bowls. Hope I can find them. I have fond memories of al fresco meals with my family while growing up. We just called it “eating outside”! Thank you for sharing ALL your wonderful ideas. We then have some idea as to how to decorate our home and garden. Beautiful setting and tablescape, Ann. I appreciate you sharing your fond memories of time with your parents~~~~mine have been gone so long. Such a great post! Your tables cape is gorgeous. I love the glasses. Do you by any chance remember where they are from? That’s perfectly fine! Thanks for the brand. It’s so helpful. You have awesome taste! Love this tablescape Ann! Great job! The blues are so relaxing. You just want to pull up a chair and linger. Thanks for sharing this with us. I don’t think you realize how much your blog and sharing means to many of us, Ann. Always look forward to what you are sharing whether its decorating or sharing memories. One thing no one can ever take from us are our memories. In my line of work I share that with the families that have lost a loved one. Memories help make us who we are. So share, share, share. Very pretty tables one and all. I am ashamed to tell you I use plain white paper plates and plastic cups. We eat in the dining room with 3 open windows which is lovely. My leg is getting worse and moving around is harder every day. Ann, I too love dining al fresco and your layered table is just beautiful! I’m crazy about that pitcher at the center of it all. But most of all I enjoyed reading about your sweet memories of lunch at your parents. Thank you so much for sharing that with us. What a lovely memory to have, indeed! Your table is great. You make it look so easy and I just love blue and white. 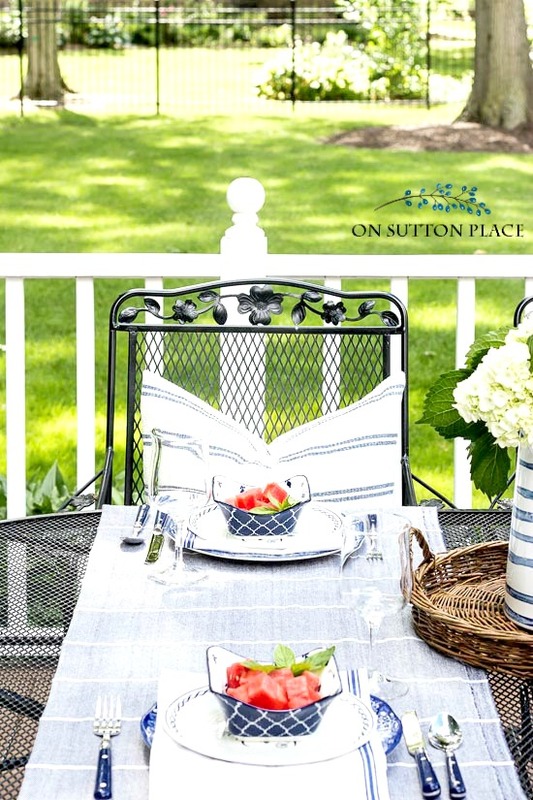 Such a beautiful setting Ann, blue and white is always a favorite. Thank you for sharing these great tips! Ann, we have so much in common! Layering and mixing is my favorite thing and I completely agree about making that extra effort to create special moments and memories! I love your setting, it’s gorgeous!